Evil News Daily-Warning: This is a Super Villain Blog! *Do you have a blog focused on the Superhero Community (or do you know of one that should be listed here)? Join our 'Blog Buddies' program, and we'll list your blog here. If you are looking to expand your blog reach (at no cost to you), please contact us so we can promote it here. 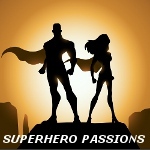 The only requirement is that your blog be primarily focused on the Superhero community. We reserve the right to determine the sites we will partner with in this program.